Toronto: Music/Musique New Brunswick (MNB) has announced that veteran singer-songwriter Ken Tobias will be the recipient of the first Directors' Lifetime Achievement Award. 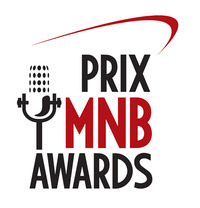 The announcement took place in Saint John, New Brunswick during a ceremony to announce the nominations for the Prix MNB Awards. Ken will receive his lifetime achievement award during the Prix MNB Awards Gala to take place on Sunday, October 20, starting at 8 PM at the Imperial Theatre in Saint John. MNB Chair Richard Hornsby commented: “New Brunswick has a history of successful composers and musicians that have gone unrecognized. People that have made significant contributions to their art and the development of the industry need to be celebrated and rewarded for their dedication and contributions. It is with this award, we are changing that." The first Directors’ Lifetime Achievement Award recipient Ken Tobias is one of Canada's most accomplished singer songwriters with a career spanning over four decades. Ken reached national prominence in the 1960's as a cast performer on the Canadian television series Music Hop and on Singalong Jubilee. Early in his career Ken moved to Los Angeles where his first record, "You're Not Even Going to the Fair", was produced by Bill Medley of the Righteous Brothers. Everyday throughout North America and Asia the songs of Ken Tobias are heard on Classic Radio. Ken’s songs still resonate and bring joy to listeners because they are easily remembered. Songs like “Dream #2”, “I Just Want To Make Music”, “Every Bit of Love”; Give A Little Love”, Fly Me High, New York City and “Stay Awhile” are staples at radio. The Bells' recording of his song "Stay Awhile" became an international hit, selling over two million copies and reaching No. 7 on the Billboard charts. His credits include: nine award winning songs, ten charted songs, five songs documented by SOCAN for over 100,000 radio airplays in Canada and one song with 2-million worldwide sales by various artists in several languages. Throughout the 1970s Ken recorded and released several albums on labels such as MGM/Verve, Polygram and Attic Records. In the ‘80s Ken went independent and continued to record, perform and produce. Ken’s talents go well beyond his achievements in music. Now based in his hometown of Saint John, New Brunswick he is also an accomplished visual artist with hundreds of his paintings now hanging in homes in Canada and the United States. 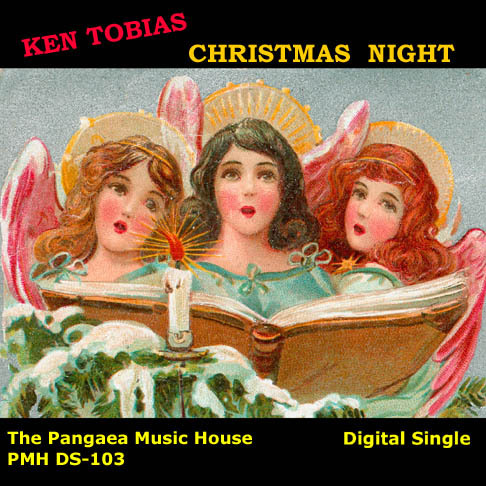 "Christmas Night" the new holiday song by Ken Tobias is now on iTunes. We are happy to report that this beautiful new song is now available for preview and download in the iTunes store. The Tobias team requests that Ken's fans and friends please share the word. It would be great if fans also left a review of the song at iTunes. It does make a difference. Thanks for supporting the music of Ken Tobias. Direct link to Christmas Night on iTunes. New Christmas digi-single from Ken Tobias - "Christmas Night"
For a second year in a row Ken Tobias has released a new Christmas song in time for the holiday season. The song "Christmas Night" was written, produced, arranged by Ken and is released exclusively as a digital single. "Christmas Night" nicely mixes traditional style and spirit of holiday carols with a modern approach to both the music and the lyrics. While Christian in its theme "Christmas Night" speaks to the joyous spirit of the season and a universal celebration of family. Ken's rich voice is not only exceptional in his interpretation of his own story-song but is dramatically haunting in the spoken-word section of the song. In the "hallelujahs" Ken demonstrates easily that he still has the great vocal chops even after over four decades of singing and performing. "Christmas Night" is now available for purchase as a download in Ken's online store via Bandcamp and at the iTunes store. You can support Ken's music by purchasing the song online and sharing the news with your friends across your social media network. Thanks for your support of the music of Ken Tobias. Well.....it's been some time now since I wrote to you all and lots of musical water has gone under the bridge. On October 5th to be exact I had the great pleasure of playing my music in Halifax at Stayner's Wharf Pub & Grill a wonderful restaurant and music venue nestled down by the Halifax harbour. Oh! my! What a night. In my musical life out of the hundreds of performances I've done, there have been a small number of shows and audiences that were beyond great but fantastic comes to mind. Well this was one of those nights. My keyboard player Graeme McCausland and my assistant Tim Little and my manager and brother Tony were knocked out with the welcome we received. Todd Abbass, the owner was so good to us. He made us feel most welcome. The sound was so good. The staff was great and helpful and the audience......spectacular. So receptive and giving. It made Graeme and I play our little hearts out and a standing ovation to boot. Can't do better than that. I must add to this adventure. We drove down to Halifax from Saint John in Graeme's van. Very comfortable. Got to our sound-check in good time and everything fell into place very well. We did our show sold some cd s and signed some autographs. Todd treated us to some great food and we then prepared for the 4 hour drive back to Saint John. Little did we know that we would drive into the snow storm from hell. When you drive from Halifax you eventually hit and altitude of around 1000ft or so around the Wentworth Valley and it's just high enough for things to get nasty with the weather. After we hit the toll road all hell broke loose a snow squall started up and it was the type that comes directly at you and almost hypnotizes a person. First Graeme drove until he could take no more and had to rest his eyes. Tim Little my friend and assistant took over after Graeme. Tim has hundreds of road hours logged-in on transport trucks on roads all across Canada. Tim knew just how bad the roads were and took his time but we still had several moments when we were white knuckling and our hearts were up in our mouths. You could hardly see 5 feet in front of the van and the road more than once disappeared. Well needless to say we made it home safely after we came down from the mountain. 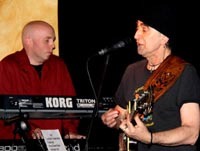 I can't help thinking though that after such a stellar night at Stayner's and reaching such a great musical camaraderie with the “Music Muse” and the good people of Halifax, that some dark force was trying to bring us down. Well.....they didn't and never will. © Ken Tobias. All rights reserved.